First I want to thank everyone for all the hard work you have put in, you are the best! I have seen beautiful restores and it is also great to see our newbies posting their work on the forum! A couple of times I have noticed that a finished restore was uploaded to Photoshelter with part of its file name missing. 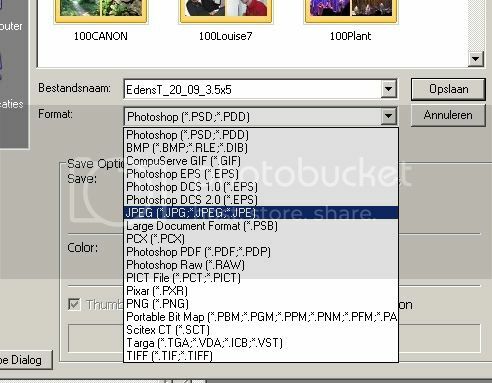 This is a common problem with files that have an additional "dot" in their name such as EdensT_09_3.5x5. After working on a restore (pdf) you want to flatten all layers and save it as a jpg file. That is where the problems may start. 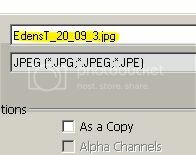 the result will be EdensT_09_3.jpg! The file name is partially lost. This happens because Photoshop uses the last dot in the file name to position the jpg next to. How to avoid the file name from changing like that? Don't use the drop down menu to pick the desired extension, instead type .jpg next to the file name EdensT_09_3.5x5 and then click on save! Thank you Hannie! I've had that happen to me a dozen times and never knew why. I resorted to writing out the file title in words instead of numbers - five_point_five_by_three_point_five - which makes for a very long and awkward file name. I shall remember this next time Photoshop does a drastic pruning of my file name. I had the same problems last year and it took me a long time to figure out why part of my file names kept disappearing! (Long live the Internet) I found the answer on some obscure forum. After I got a couple of uploads this week with the same shortened file name problem I tried to look it up again on the Net. No matter what search I typed in Google, I can't find anything on the subject now.